The Australian Youth Band (AYB) was first established in 1978 as the Moomba Youth Band, to perform as a ‘one-off’ at the Melbourne Moomba Festival Silver Jubilee. As a result of this successful performance, and many others since, we have gone on to become partnered with some of Australia’s most influential musicians and community leaders, some of whom have now gone on to become Patrons of the band. 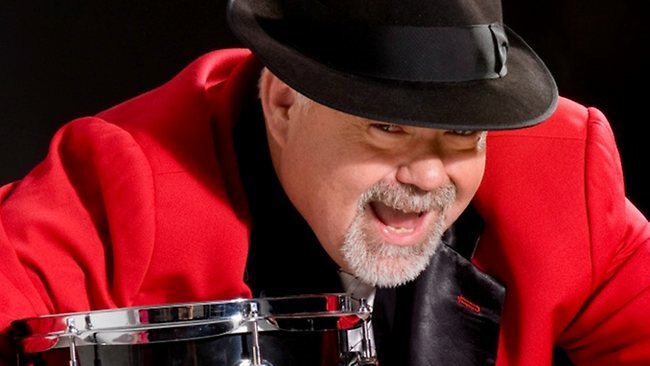 John Morrison is a gifted jazz drummer, band leader, record producer and music educator who, together with his many groups has headlined every major event and festival in Australia. He has been a Patron of AYB since 2001. John and his wife, singer Jacki Cooper, regularly visit disadvantaged communities in the Northern Territory, inspiring hundreds of children to get involved in the joys of music, and giving young indigenous Australians the opportunity to try jazz. John has appeared with AYB on a number of occasions, including five of our annual concerts and in March 2014 playing to Sydney audiences at Darling Harbour. Rhonda was appointed as AYB’s second Patron at our 2011 Annual Concert where she also performed a fabulous rendition of “Sway” with the band. From television to the big screen, musical theatre to opera, cabaret to the stage, Rhonda Burchmore has forged a very successful career in show business in Australia and internationally. Among her many achievements, Rhonda was nominated for a 2002 Mo Award for Female Musical Theatre Performer of The Year and Female Vocal Variety Performer of The Year. In 2012 Rhonda was awarded Female Entertainer of the Year and in 2014, Rhonda received a Medal of the Order of Australia for her service to the arts and community. Les Youie was made a Patron of the Australian Youth Band in 2014 in recognition of his outstanding dedication, service, support and advice over a long period. He is an inspirational example of the importance and value of family, community involvement and youth development in our society. Over the years, Les has held the positions of President 1979-1985, Treasurer 1992-1993, and Public Officer 1988-1996 for the MMYB Association. He was the first recipient of the Association’s prestigious Life Membership award in 1989. In 2007, Les Youie was awarded the Order of Australia medal for his service to community organisations in addition to our own, including the Young Chinese League. 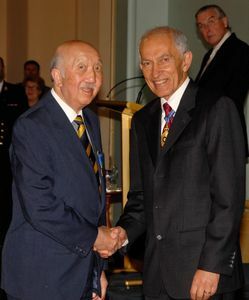 Les is pictured here, on the right, receiving the medal from His Excellency, Professor David de Kretser, A.C., former Governor of Victoria.